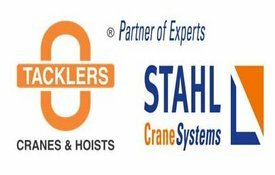 “TACKLERS” latest tie up with STAHL Kits has added a New Dimension. STAHL being a 140 year’s old KIT manufacturing company which sells kits through its partners across globe is now available in INDIA with Techno Industries. International brand at your door step with competitive Indian PRICING and SPARE & SERVICE set up. Recently TACKLERS cranes were supplied at M/S. SIGNODE INDIA LTD; DAHEJ; GUJARAT with STAHL components. Cranes were installed in NOVEMBER’14 and all working smoothly.